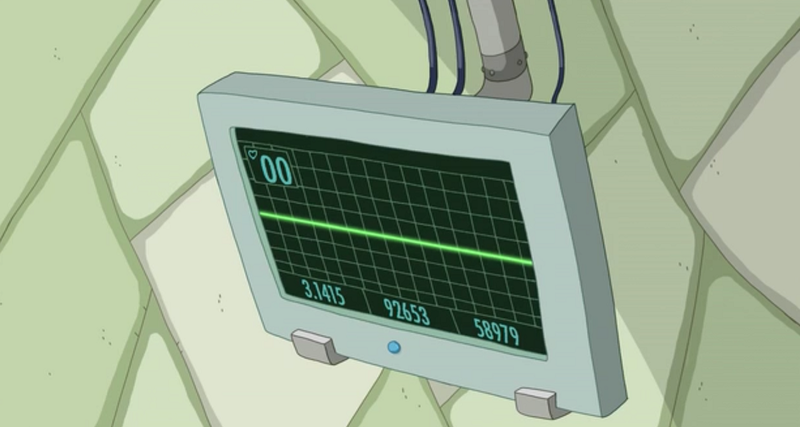 At the beginning of the Mortal Recoil episode of Adventure Time, we can see this electrocardiogram of Princess Bubblegum. 92653 is one Zip code of Laguna Hills, California. 58979 is the ISBN of a book mentioned in the Callinectes sapidus crab Wikiipedia page. None of those two numbers make sense... do they? Is there an explanation for those numbers? In the emergency room at the start of the episode, the heart monitor screen is displaying the first 15 digits of pi. Not the answer you're looking for? Browse other questions tagged adventure-time . Is the Land of Ooo really a post apocalyptic Earth? Why are humans considered a delicacy in the Land of Ooo? Why doesn't the Ice King's crown affect Jake? Who is the Ice King, really? S07E17 of Adventure time, all food is alive. Why and what is a message?